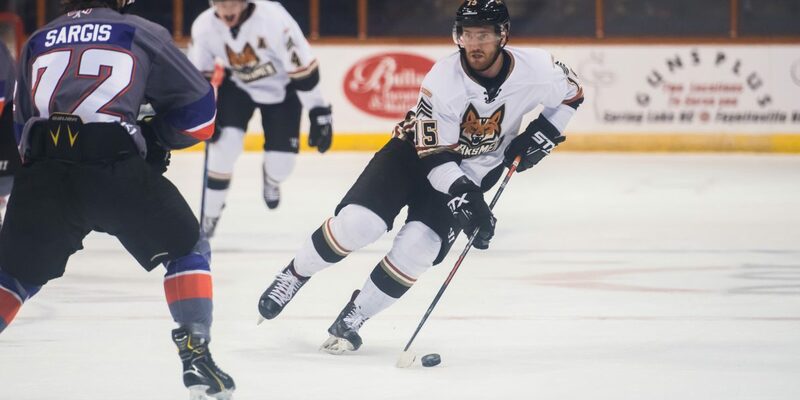 FAYETTEVILLE, N.C. – A split in the series last week with Knoxville brings the Marksmen into the final meeting of the season with the Ice Bears, still in a tie for fifth place in the league. The Marksmen take the trip west to Knoxville where they played just last Friday and won 5-3 in that contest. Fayetteville goes into the contest posting a 2-1 record at Knoxville’s Civic Coliseum, with this being a full-road series across the Smoky’s. Fayetteville played well on the offensive end, scoring seven goals in two contests with the Ice Bears last weekend. The Marksmen will be missing out on a big part of their offense of recent, as forward Brian Bowen was called up to the ECHL’s Norfolk Admirals. Bowen had been a crutch of the Fayetteville offense, including two goals just last weekend and seven in the last two weeks. With the loss of one, comes the gain of another, as David Mazurek is back from his stint with the ECHL Atlanta Gladiators. David logged five points in 17 appearances with Atlanta. He will rejoin the surging Marksmen and looks to fit into a role that has much changed since his last stint in Fayetteville. When he was with the Marksmen, he was one of the league’s leading-scorers, and an Alternate Captain. Fayetteville’s power play has remained playing a key role in their offensive game. The Marksmen went 2-7, (29 percent) on the power play last weekend. The second-rated power play in the league looks to improve upon their 21.8 perecent clip for the year. Knoxville currently leads the league (and ALL of professional hockey) with a 91.5 percent successful penalty kill, they successfully stopped five Marksmen power plays last weekend. Both teams come into this weekend with a record of 18-13-4, tying them for fifth place in the league. Neither team could gain any ground last week as they split the weekend set. If trends continue, this could be a great weekend for the Marksmen as the road team took both games last weekend. If a team gets all four points in this series, they could vault up and be only a few points out of third after these games. Most importantly, they’d gain serious ground over the other, as they no longer meet this season. The Marksmen look to improve their already good 9-4-3 record away from the Crown. Fayetteville needs to perform away from home as they play their next five games outside of North Carolina. Every point matters as the Marksmen are fighting for playoff position and the possibility of more home games in the postseason. You don’t want to miss this series. Join us at On-After Sports Bar and Grub both nights this weekend, for the Home Away From Home watch party – with great food specials and plenty of awesome drinks. If you can’t make it out, listen all weekend long with the Voice of the Marksmen Shawn Bednard on MarksmenRadio.com.